The E64 section is under construction - give me a chance, I've only had one for 6 months! I do plan to carry on mending stuff on the new car though - but I've only done a few bits and bobs, so most info is from other sources to start with, the TIS, RealOEM, WDS being the main ones. This is my seventh BMW V8, and this is certainly the fastest - an E64 convertible 650i Sport. This is a bit of a change though, the other six cars all had very similar engines, the M60, M62 and M62TUB. They all had exactly the same problems, well, except that each new version added a couple of new problems such as timing-chain guide failure and the lovely Vanos noise. I've only had the car 6 months or so, but the N62TUB48 seems to have the same old problems - failing Pressure Control Valves (PCV), although they are now called Pressure Regulating Valves just to throw us off the scent, can't fool us though, the blighters still split and get gummed up - fortunately the fragile and inaccessible Oil Separator Valve (OSV) used on the previous engines are now no longer housed behind the timing covers but are now part of the valve covers. Thank goodness for that. On the N62TUB48, coil-over-plug units fail, valve cover gaskets leak, yes, it's back to the old problems again! This site is for anyone that owns an E63 or E64 BMW 6-Series and wants to repair the car themselves. The information on this site is either from my own repairs (BLUE buttons) or from information I have found whilst investigating problems (GREEN buttons). The SILVER buttons are for information on the cars systems, owner's manuals and circuit diagrams. I am the current owner of a 2007 E64 650i Sport Convertible and a 1999 840ci Sport Individual and an ex-owner of a 2000 740i E38 Individual a 1997 840ci Sport, a '93 E32 730i V8, a '98 E38 735i V8 and a '99 E38 740i. 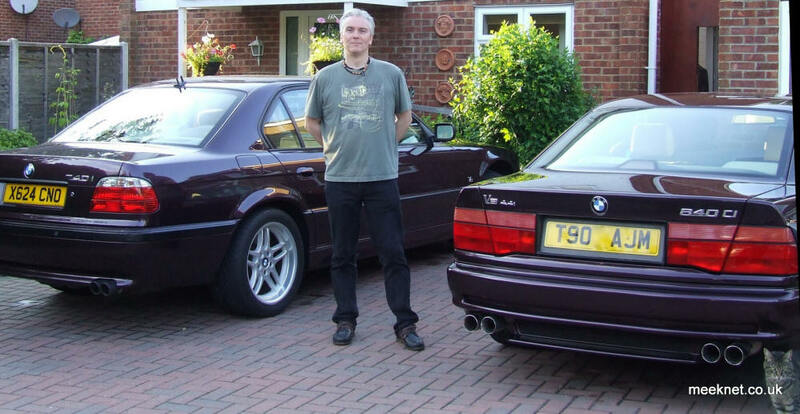 I am an Administrator (Timm) on The 7 Series Register which (in my opinion) is the best Forum for 7-Series cars, we have now started an E31 section as the 8-Series shares many parts with the 7-Series E32 and E38, there are also a few 6-Series members popping up. All these fixes and information can be found on the Forum plus a great deal more by experts in all versions of this great series. My initial help came from this Forum and this gave me enough confidence to perform other repairs. The 7 Series Register is free to join, there is no need to register but please do and you will find a world of friendly 7-Series owners ready to help you! Some of the repairs are pretty straightforward, some are pretty awkward but none of them are that difficult. Just like most of The 7 Series Register members I am not a mechanic and consider myself a rank amateur. However I am lucky to have the experience of our members and my own experience of my four 7-Series and two 840ci's, the greatest asset we all share is knowledge of what normally goes wrong and how to fix the problems! It is worth mentioning that the cars worked on are UK (right-hand drive) models. There are a few differences between RHD and LHD variants. Sources of information are the TIS (Technical Information System) and the ETK (electronics part catalogue). All three are usually available from Ebay for a few quid. Be aware though, that the TIS runs on Windows XP as the latest Operating System which is why I have added a few routines from it here. The brilliant RealOem website is excellent for finding the correct part numbers and for exploded diagrams. I am also a musician, so click on the 'Chase' tab and download some music while you peruse the information!